Does the Margaret Haywood story signal an end to valuable whistle blowing? I've been a columnist for over thirty years. I don't know how many times I've been asked to express an opinion, say the unsayable, poke a stick through the bars, have a bit of fun. I do it because I am interested; love what I do and am never in any doubt that it is the ultimate privilege. I can 'gob-off', have my say and shout – no! Or yes! Whatever... but I like to think that I say 'well done' when a 'well done' is deserved, and only put the boot in when it's necessary. Heaven knows, over the years, the roof has come in on my head for doing it! Having an opinion can give you grief. This month there is only one thing to write about, and it is controversial, tricky and contentious. The story is that of Margaret Haywood, and if you think it has nothing to do with the pharmaceutical industry, you are sadly mistaken. In case you have been away; trekking in Katmandu or buried in the business planning process for the next NHS financial year (explain to me why so many pharma companies account December to January when the NHS accounts March to April), and don't know who Margaret Haywood is, I'll catch you up briefly. Margaret Hayward is a nurse who was struck off the Nursing and Midwifery Council Register for secretly filming, in a hospital, for a BBC Panorama programme, that exposed the neglect of elderly patients. The BBC reported: "Margaret Haywood, 58, of Liverpool, argued that she had acted in the public interest, but a panel found that in recording patients at the Royal Sussex Hospital, for the July 2005 documentary, she was guilty of misconduct and 'it would not be in the public interest for her to be able to practice as a nurse'." I have just one thing to say – testiculus maximus. I would like to say b**%*$% – but the editor won't let me. At the hearing Margaret Hayward said, "I was convinced that it was the right thing to do. I had reported the issues and nothing had been done. I felt I owed it to the people on the ward." As I understand it, here's the story. Margaret was very unhappy about the standard of care where she worked. She told her bosses, who did nothing about it. Out of love, care, frustration and angst she approached the BBC. I have worked with the BBC on occasion and found everyone I have ever dealt with to be thorough, professional and attentive to detail. The organisation also doesn't make a move unless it has the lawyers, health and safety and politically-correct police departments giving clearance. The BBC told Margaret that it needed evidence and she agreed to film secretly in the ward to deliver this proof. The pictures were self explanatory, condemnatory and jaw dropping. Concerned about confidentiality issues, the BBC sought permission to broadcast from the relatives. Some of the patients in the film had died and others were too confused and demented to be able to give permission themselves. The relatives agreed and the material was broadcast. The NHS Trust, at this point, must have lost its collective common-sense. Instead of the Trust chairman inviting Margaret for morning coffee, thanking her for highlighting the embarrassing truth and asking her how to put it right, the idiots embarked upon a demented course, reporting Margaret for goodness knows what to the Nursing and Midwifery Council. This culminated in a full-scale disciplinary hearing and the world knowing what a crap service it provides. Ask yourself: would you want your granny in its hospital? Linda Read, who chaired the Nursing and Midwifery disciplinary panel, said that Margaret had committed "a major breach of the code of conduct" by "compromising the dignity of elderly patients in the last stages of their lives." Sorry Linda, no. It was the piss-poor care standards that compromised the dignity of elderly patients in the last stages of their lives. In my opinion it is the chairman, the chief executive and the nurse director of the Trust who should crawl away in shame. Gary FitzGerald, chief executive of the Action on Elder Abuse charity, criticised the panel's decision. He said, "It would appear that protecting the interests of the nursing profession has now taken precedence over uncovering and highlighting the dreadful conditions of older people on an NHS ward." Gary is right. The press piled in. Had the Nursing and Midwifery Council lost the plot? The electronic version of Speaker's Corner perked up and YouTube sprouted four petitions to 'save Margaret'. Hundreds signed up. The RCN piled in and only Andrew Lansley, the Tory health-bloke, spoke in favour of the decision to strike Margaret from the NMC register. If there is bandwagon, Andrew, try and jump on the right one! There is an appeal outstanding. I'm told the RCN is funding Margaret and we wait to see. At stake is not just Margaret's job and livelihood. At stake is whistle-blowing, pulling the rug and the safety of patients tucked away in the inaccessible corners of the NHS; in the wards where no one wants to go. Those places where death is the only discharge and there is never any good news. Places where the secret dirty work of the NHS is done. The toil that few of us could do. We rely on the Margarets of this world and we should be grateful for them. What does this have to do with pharma – apart from the obvious (we will all get old and will need a Margaret in our lives)? The real story is about whistle blowing. It was whistle blowing that revealed animal cruelty in pharma's research processes and has made the whole process more civilised. 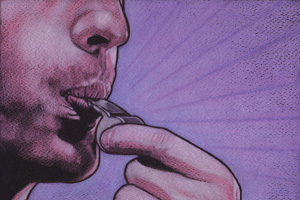 It is whistle blowing that has cleaned up clinical trials and made them safer. We should get older and wiser. We should be open to our critics. They may have a point. Listen to them. One day you may have reason to be grateful to a Margaret.